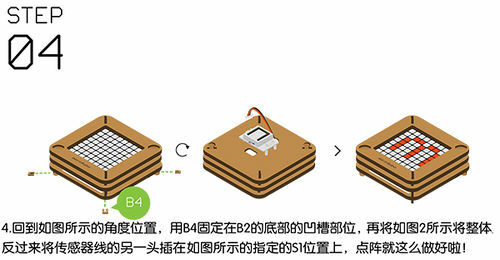 Objective: To be acquainted with the use of the Microduino Dot Matrix. The color display quality of each point is 24 bits, and the color display effect of the entity is 32k. Support IIC communication protocol, and the IIC address can be set（1~64）. Please keep to download and update the Microduino official latest IDE. Overlay Microduino-Core and Microduino-USBTTL together. 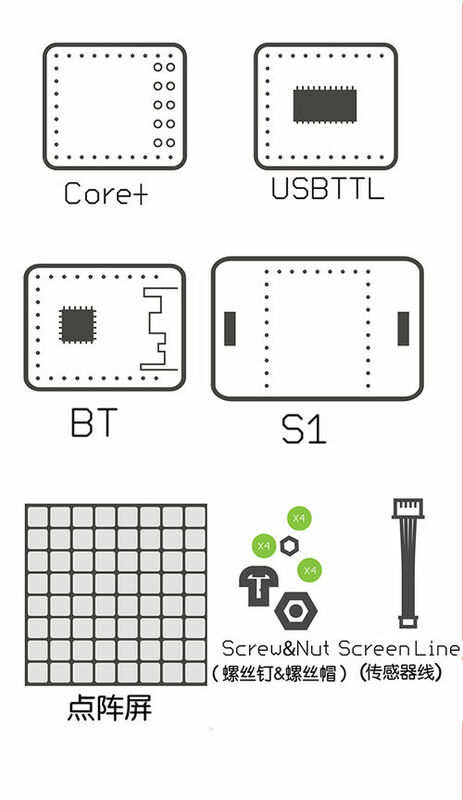 Connect Microduino-USBTTL with USB cable and prepare to upload the program. Click [Tool], confirm board card（Microduino-Core） and processor（Atmega328P@16M,5V） selected correctly, and select the corresponding port number(COMX). Click [File]->[Open], browse to the project program address and click "Dot-Matrix-Base.ino" to open the program. After all these items are right, click "→" button to download the program to the development board. Insert structure A3 vertically into structure A1. 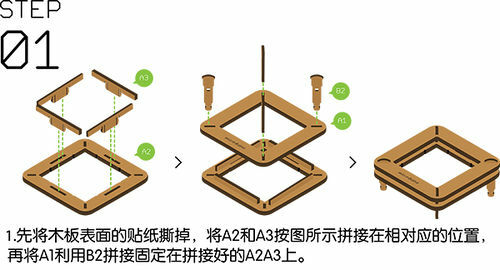 Use structure B2 to connect structure A1 and structure A2. 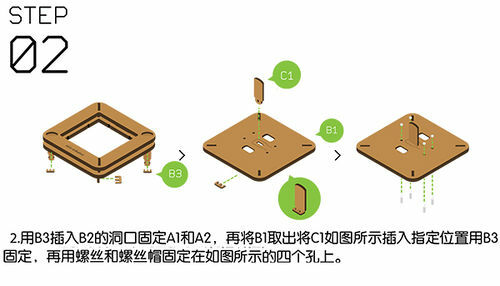 Insert structure B1 into structure B2 too, and then use structure B3 and structure B4 to jam structure B2. To change the IIC address of the dot matrix module, you can refer to [The method of setting the IIC address of the dot matrix module] tutorial. 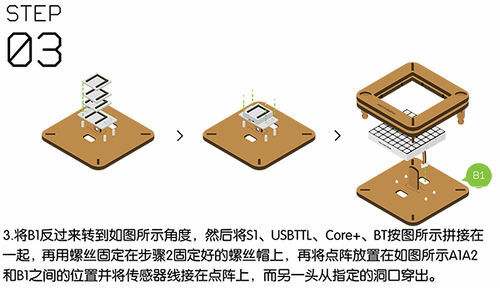 Reserve the cable near to the key interface of the dot matrix module, in order to connect the IIC interface of Microduino-Cube-S1. Stick the dot matrix modules to the inward of the shell with two sides adhesive tape. 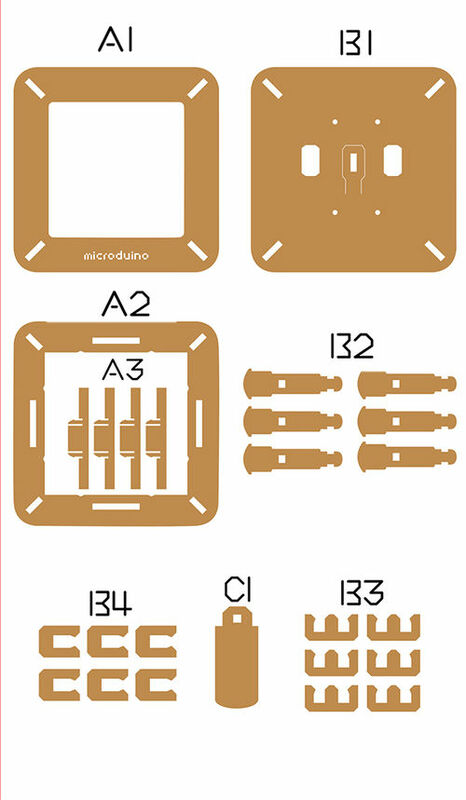 Stack the following modules on Microduino-Cube-S1. Stick Microduino-Cube-S1 on the back of the structure B1. If successful, the dot matrix screen will display the following shapes and characters in turn. Define the IIC address that is set for Dot Matrix module is 64 and cascade type. Get the IIC address of the device. Set the color of each LED randomly. string：An arbitrary string. MODE: MODE_H display characters horizontally. /MODE_V display characters vertically. time: Show time.（flow velocity）. z: X/Y coordinate. X:Horizontal coordinates Y: Longitudinal coordinate W：The width of the image H：The height of the image logoA: Image array. X:Horizontal coordinates Y: Longitudinal coordinate logoB：Image array(Because logoB is the array of BMP file, you don’t need to obtain the image size again. To get in-depth knowledge about BMP, you can refer to the dot matrix module display the BMP color graph). This function is used to drawing a solid rectangle. X: Horizontal coordinate. Y: Longitudinal coordinate. I: Length. W: Width. This function is used to drawing a solid apex angle bending rectangular. X: Horizontal coordinate. Y: Longitudinal coordinate. I: Length. W: Width. This function is used to draw a hollow rectangle. X: Horizontal coordinate. Y: Longitudinal coordinate. I: Length. W: Width. This function is used to draw a hollow apex angle bending rectangular. X: Horizontal coordinate. Y: Longitudinal coordinate. I: Length. W: Width. This function is used to draw a hollow circle. X: Horizontal coordinate. Y: Longitudinal coordinate. D: Diameter. This function is to draw a solid circle. X: Horizontal coordinate. Y: Longitudinal coordinate. D: Diameter. This function is to draw a straight line. X: Starting point horizontal coordinate. Y: Starting point longitudinal coordinate. M: Finishing point horizontal coordinate. N: Ending point longitudinal coordinate. Q:How to know the IIC address? A:Refer to[method to set the IIC address of the dot matrix module] tutorial. Q:How to use multiple screens at the same time? 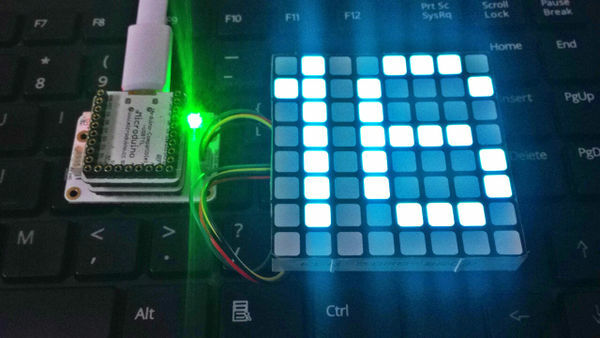 A: In the next page Open Source LED Dot Matrix Clock, there will be specific introduction of the cascade of multiple Microduino-Module Dot Matrix. Q:Why does it display incompletely after counting to 20? A: Because the dot matrix resolution is only 8*8, there are not enough pixels, and the screen can't display the numbers after 20 completely. This page was last modified on 27 October 2016, at 03:02.